Train staff to integrate preventive maintenance and indoor air quality (IAQ) management strategies to save money and protect health. Build a committed and capable team positioned for success. 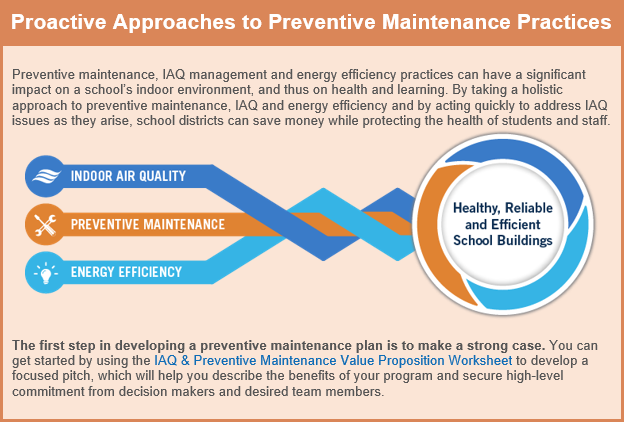 Ensure your school's IAQ preventive maintenance program runs efficiently. Communicate effectively to raise awareness of the importance of IAQ preventive maintenance and increase buy-in and support. 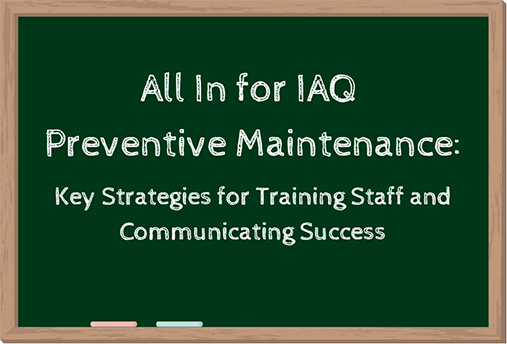 Replicate the best practices of school district mentors to implement communications and team training strategies as part of a sustainable IAQ preventive maintenance program. What Is the IAQ Knowledge-to-Action Professional Training Webinar Series?The IAQ Knowledge-to-Action Professional Training Webinar Series comprises 1-hour technical, core-competency, web-based trainings that demonstrate how the knowledge gained in the IAQ Master Class Professional Training Webinar Series can be translated into actions that improve or sustain an IAQ management program within your school or school district.Learn from technical experts, industry leaders and model school districts during these webinars, which are followed by 30-minute mentoring Q&A sessions.Gain recognition for your knowledge acquisition and commitment to action by receiving a certificate of completion for each training.